Chengdu Kilowood and CLT Co., Ltd. is a leading manufacturers for all the turning tools, milling cutter, hole making tools and tooling system in China. Located in Chengdu,Sichuan, China, with an area of 29000㎡. Equipped with first-class machines and equipments for producing NC tooling products and is engaged in designing, studying, developing, producing and selling NC Tooling and inserts for all kinds CNC machines and machining assembly lines. Supply high efficiency turning, milling, hole making tools, tooling systems. As per requirements of end-users, the products of Kilowood Cutting Tools Co., Ltd. adopt standards of GB, ISO, DING, ANSI, and JIS, developing, designing and producing standard and non-standard tooling and tooling system products. Kilowood cutting tools are the best one in China, as the stable and higher accuracy, Kilowood is famous in China industry and the world. 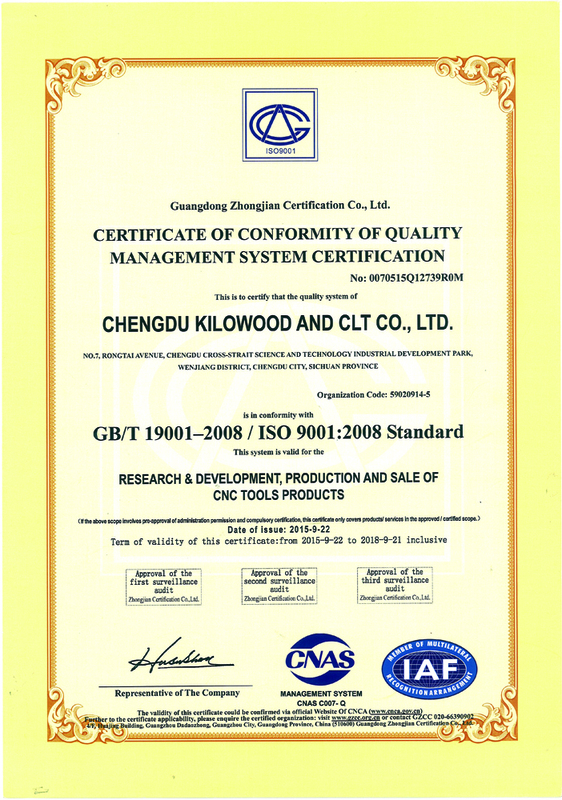 Chengdu Kilowood and CLT Co., Ltd. supply the best products for your choice.